Two Americas: but is the divide one of ideology, not wealth? Dennis Prager writes that there are Two Irreconcilable Americas . Here’s a bit of it, but the whole thing is very much worth reading. It is time to confront the unhappy fact about our country: There are now two Americas. Not a rich one and a poor one; economic status plays little role in this division. There is a red one and a blue one. He’s correct, with some qualifications I discuss below. In this article, Mr. Prager makes the case that the Left is primarily focused on equality, thoroughgoing secularism, and internationalism/moral equivalence, while the Right is focused primarily on freedom, a more or less Judeo-Christian society with secular government that is not hostile to religious values, and American exceptionalism/patriotism. This is a post in the chain on “The Left at Christian Universities”. The last, recommending a very important book, was The Left at Christian Univs, part 3: Diversity. 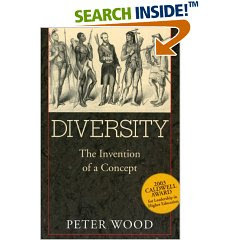 Following the useful practice of Peter Woods in his book Diversity: Invention of a Concept, I will use the italicized form of the word diversity to represent the common use of the term as political enterprise, and the unitalicized form to denote the conventional meaning of the word “diversity”. There are two possible strategies with disclaimers. You can put them at the beginning, or you can put them at the end. I am doing both. I may also put a few in the middle. I am not a racist. Not even close, not in my dreams, not in any way at all. I am not a bigot. I have warm fuzzy feelings for all kinds of people, from all kinds of backgrounds. I am not fearful of change. Anyone who knows me would laugh out loud at the idea. I am an (undead) white male. If you think that means you don’t need to pay any attention to my perspective, you may be a racist. I regularly donate blood to the High Desert Blood Bank in San Bernardino County, California. I am AB negative (the rarest blood type, about 6 of every 1000 people), and I am CMV negative (some virus I never got, but which most people do), so my blood is good for people with compromised immune systems: the very old, and the very young, as in preemies. For reasons I don’t understand, AB negative blood plasma is the “universal donor” in plasma (not whole blood), and so, since my plasma is so rare and valuable, I give blood plasma about every month. They tell me that my plasma is probably in the bodies of bunches and bunches of pre-maturely born babies in the San Bernardino area, many of them of African-American descent. I consider it something of a sacred duty to do this. OK? This is almost embarrassing, but the point needs to be made. The reason it needs to be made is because the Left routinely paints anyone who disagrees with the entire diversity enterprise as a hater and a racist. I am neither. These thoughts form the backbone of the discussion in following posts. In later posts, I’ll discuss the implications for Christian colleges/universities. I’ll try to support them with a reasonable degree of evidence, some unavoidably anecdotal, because there are certain questions that social scientists simply do not ask, and the political/social commitments of diversity mavens are among them, even though they are blindingly obvious. 1) Diversity is an outgrowth of the political perspectives of the secular Left, and depends for its existence on moral equivalence arguments about the relative status and value of various cultures and sub-cultures. 2) Diversity is virtually always a supporter of the political and social Left. Diversity speakers and presenters are virtually always from the Left. The curious profession of diversity trainer means learning to sell the Left. 3) Diversity is the term that was used to disguise the essentially quota-based strategies of affirmative action, when quotas were found by the courts to be suspect. 4) Diversity is used to sneak in almost uniformly leftist perspectives in a wide variety of areas, not merely the inclusion of persons of minority races in public life and institutions. It is a complete pretense to present diversity as an enterprise that is politically or socially neutral. 5) Diversity is not about helping minorities improve their numerical representation in public life and institutions. It is about helping only certain minorities, which are perceived as not being able to raise themselves out of their current circumstances without preferences, quotas, set-asides, and special considerations of all kinds. As such, it is a racist enterprise on its face, even though its self-talk is that it is anti-racist. The subtext of diversity is simple: if you are one of the favored minorities, you aren’t able to make it on your own, and need diversity to help you get where you want to go. If you are not one of the favored minorities, you should be ashamed of your racist heritage, and if you resist diversity in any way, it is further proof of your racism. I’ll try to get around to commenting on each of the points above in subsequent posts. UPDATE: Part 5 in this series is here. If you care to understand the development of diversity as an ideological, political enterprise in higher education, you need to read this book. It is essential reading for anyone, right or left, who wants to understand the development of the diversity initiatives that are so popular in colleges and universities, as well as certain non-profits, government agencies and even some businesses, especially large corporations. It is very scholarly, dense with references (they don’t get in the way of the narrative, but they provide sources for further study, or confirmation for doubters), historically grounded, yet highly readable and accessible to general readers. The author is a professor of anthropology, and former Associate Provost of Boston University. He’s seen academia from the classroom and the administration building. Better reviews than I would be likely to write can be found here and here. As I discussed in The Left at Christian Universities, part 2, a trend for Christian universities and colleges seems to be to move left by adopting essentially secular enterprises. Diversity, as understood for the last 30 years or so, is one of these, regardless of how we adorn it. In an upcoming post, I’ll very briefly review some that history. However, for the full story, from 19th century antecedents to 1970s court cases to 1990s academic dogma, this book is a goldmine. UPDATE: Part 4 in this series here. 3) changed from a college to a university in the last 25 years or so (often a sign of the outworking of growth and ambition to be well-thought-of, and the reflection of that in marketing initiatives). It matters because of what we’ve learned about the typical developmental trajectory of church-related colleges over the last 100-150 years. Simply, colleges founded by churches rarely (if ever) become secular by moving to the right. (Perhaps you know of one that I don’t. If so, do you know of two? Three? There are a lot of examples the other way.) These institutions become secular by moving to the left (the Christian left) and then it seems to take a generation or so to gradually shed the Christian identity in all but name. One may conjecture about the reasons for this, and about just how the mechanisms work. It seems critical that we examine the historical sources of the ideas that are represented in and by the Christian left and right. If an idea or perspective can be shown on historical grounds to have arisen from sources which are anti-Christian (something more than merely non-Christian), we are correct to look with great suspicion on its current manifestations, regardless of how much God-talk we surround it with. For example, rules of logic developed from the writings of Greek philosophers are merely non-Christian, not anti-Christian. On the other hand, we should be deeply suspicious of a teaching about the value of human persons that flows in a logical way from the assumption that we are mere meat machines, an anti-Christian perspective that cannot possible lead to sound moral judgments. This is not a violation of the “all truth is God’s truth” principle. We are not talking about denying the validity of science, or the rules of logic, or the fundamental principles of economics (if we can agree on what they are), i.e., theologically neutral propositions flowing from “the general revelation”. We are talking about the danger in trying to harmonize the perspectives of people who were specifically anti-Christian with Biblical teaching; drawing their viewpoints, flowing from anti-Christian stands, into the church’s teaching, perhaps because these viewpoints sound caring, or objectively rational, or appeal to us emotionally in some way; and then wrapping the entire affair in judiciously selected Bible verses so we can assure ourselves of our continued piety, while experiencing a chilly frisson of self-congratulation at our open-mindedness. How concerned should a Christian be when he finds himself agreeing on policy matters and social issues with well-known atheists? The answer, of course, is it depends. It depends on whether or not the particular matter of agreement flows from a commonly held perspective or understanding that is itself more or less theologically neutral. On the other hand, it should evoke great concern when a specific anti-Christian perspective, flowing in a consistent way from an anti-Christian worldview, becomes something we adopt as our own, having decorated it with hermeneutic distortion of Biblical texts. The Christian left seems more likely to ally itself with initiatives and perspectives whose origin is outside the church. These include abortion “rights” (flowing from Margaret Sanger’s eugenics views, among other places), certain views of science’s role in life and faith (especially sympathy with the neo-Darwinian synthesis), diversity, multiculturalism, sympathy with socialistic approaches to social problems, anti-military perspectives (natural for Christians from the Anabaptist tradition, but not so much for others), modern environmentalism as a near religion in its own right, suspicion of the profit motive, class warfare, preoccupation with “social justice” (not the simple Biblical concern for the local poor), “borderless nations”, disdain for the USA (expressing itself in inappropriate moral equivalence arguments relating the USA, and sometimes our allies, to other nations), encouragement for gay marriage (more than civil unions with associated “couple” oriented privileges, which seems acceptable to many on the right), etc. The list could be longer, but the flavor is here. This is not to say that all of the Christian left agrees with all of these things. And it seems possible for perhaps one of these perspectives to find root in an otherwise Christian right perspective, though it is uncommon. However, where half or more of these perspectives are present in an institution or person, it seems reasonable to affirm identification with the Christian left. With one exception, what all of these have in common is their origins not merely in non-Christian thought, but frequently in explicitly anti-Christian thought. The exception is the specifically pacifistic Anabaptist tradition, which can encourage a thorough-going withdrawal from all civil participation that has any aspect of violence implied in its function, though this is not always completely practiced by current descendants of the Anabaptist tradition. A simple test for the “theological authenticity” of a pacifist is how willing they are for the political state to tax and redistribute to cure social problems. The threatened violence behind the power to tax is anathema to many true Anabaptists, but not to many members of the Christian left, whose concern is not primarily refraining from doing evil with violence, but with effecting specific “cures” for society’s ills, which they are only too happy to do with taxes paid by other people. Christian institutions of higher education have a way of starting as small bible colleges that will fail in a decade or two if they don’t mind their onions and focus on their main mission. Then they get a little bigger, and start trying to do other things… which is fine, as long as they keep their eye on the ball. But at some point, they find that they really want to be thought well of in the eyes of the world (the marketing/message/branding thing… must get that USNEWS and World Report rating) and begin trying to arrange adequate resources and public image such that even if they failed to carry out their primary mission for 20-30 years (or CHANGED the mission, gradually and subtly), they’d still survive, and maybe even thrive. Here is how you know you’re there: when the university creates a separate PROGRAM dedicated to carrying out its current understanding of the original mission, and then advertises that it’s doing this. (Imagine Ford engaging in an advertising program to tell the world that it was now trying to make good cars….) On the surface, this looks good… but it’s in fact an acknowledgment of serious “mission creep”… and unfortunately, the fix, mandated to create objectively observable and measurable results (of something that was never meant to be so measured… “Exactly how attractive is the curve on that fender?”), is often just another kind of “mission creep”. I’ll try to pursue each of the “Christian left” perspectives above, and review the historical roots of each. Keep in mind that I’m not an historian, I’m just a musician who reads a lot. I’ve been in Christian academia for a long time, and have had the privilege of talking, in depth, with fine educators of both the Christian left and Christian right perspective, though of course I identify more with the latter. I expect the theologians, philosophers, biologists, physicists, historians and social scientists to point out all the ways I’ve misused their disciplines. So be it. Some of them are “hoist on their own petard”, in that they have talked about interdisciplinary, integrative work so much that I have taken them seriously and am trying to do it. The principles I’ll try to follow are simple. I’ll trace the antecedents of particular ideas that I have identified as being distinctively part of the Christian left. I’ll be trying to make the case that most of them are secular, that is, flowing not out of the gradual development of the historical Christian traditions, but rather appearing discontinuously from secular, frequently explicitly anti-Christian sources. I’ll discuss the Biblical references that are made by the Christian left to support these perspectives, but I will do so in the context of the Bible overall, what is known historically about the context of the times (and sometimes what is different about the times in which we live), the teachings/behavior of the early church fathers, and the continuing tradition. I’m not sure how long this will take…. I’ve done a lot of the reading I need to do, but there is, of course, no end to it. So hang with me as we go. Suggest a book if you wish. The first one will be on the topic of diversity and multi-culturalism. Look for it soon, I hope. UPDATE: Part 3 of this series here. ‘At the time I started my business, the Left had taught me that business and capitalism were based on exploitation: exploitation of consumers, workers, society, and the environment. I believed that ‘profit’ was a necessary evil at best, and certainly not a desirable goal for society as a whole. However, becoming an entrepreneur completely changed my life. Everything I believed about business was proven to be wrong. The most important thing I learned about business in my first year was that business wasn’t based on exploitation or coercion at all. Instead I realized that business is based on voluntary cooperation. No one is forced to trade with a business; customers have competitive alternatives in the market place; employees have competitive alternatives for their labor; investors have different alternatives and places to invest their capital. Investors, labor, management, suppliers — they all need to cooperate to create value for their customers. If they do, then any realized profit can be divided amongst the creators of the value through competitive market dynamics. In other words, business is not a zero-sum game with a winner and loser. It is a win, win, win, win game — and I really like that. However, I discovered despite my idealism that our customers thought our prices were too high, our employees thought they were underpaid, the vendors would not give us large discounts, the community was forever clamoring for donations, and the government was slapping us with endless fees, licenses, fines, and taxes. Communist Party USA Online -: “A Call to Action: Defend Democracy, Change Congress in the 2006 Elections! The American Nazi Party: “The year is 2025, White people HAVE become a MINORITY in America. On our streets hang Aryan men who refused to accept the ‘New Way,’ or perhaps they just looked too White. Perhaps they never thought MUD RULE would really come. “A nation’s economy dramatically influences the daily lives of all of its citizens. Today we suffer under a greed based Jewish economy. From the Jew Alan Greenspan, who heads the nation’s financial decision making body, the Federal Reserve, to the average sheeple who’ve bought into the Jew lie of Wall Street swindler and Jew Ivan Boesky that “greed is healthy,” altruism and the good of the whole is a dead thought. What’s important in today’s society is greed and its accompanying individualism. “It’s all about me” is the prevailing attitude. It’s pretty common to talk about the Democratic Party in the USA as “the left” and the Republican Party as “the right”. From where I sit, it looks like the Democratic Party is attuned to the very, very far left, the Republican Party sits in the center, and their is no mainstream party on the “right” at all. Click the links above. Read the sites. Notice how much Democratic rhetoric closely follows the Communist Party, and how distinct Republican rhetoric is from the NAZI Party.